김수아,(2010).소녀 이미지의 볼거리화와 소비 방식의 구성.미디어, 젠더 & 문화,(15),79-119. 이 글의 목적은 소녀 아이돌 그룹의 이미지 변화에 따라 새롭게 등장한 성인 남성 팬덤이 명명되고 개념화되는 과정을 살펴보아 그 문화적 함의를 살피고자 하는 것이다. 이를 위해, 2007년 이후 온라인 남성 커뮤니티 내에서 소녀 그룹의 팬됨과 관련하여 오고 간 논의들과 관련된 문화 비평, 뉴스들을 분석 대상으로 삼았다. 소녀 그룹의 이미지는 몸의 대상화라는 차원과 소녀라는 차원에서 여성주의적 비평의 대상이었지만, 새롭게 등장한 팬덤 구성층인 성인 남성이 소녀들을 돌보고 후원하며 걱정하는 삼촌의 이미지로 구성되었기에, 불순한 성애적 관심이나 성적 대상화와는 다른 것으로 간주되었다. 이렇게 구성된 담론 내에서 여성주의적 비평의 목소리는 그 자리를 제대로 확보하지 못하고, 소녀 그룹의 성적 대상화와 같은 이슈를 제기하지 못하게 되고 말았다. 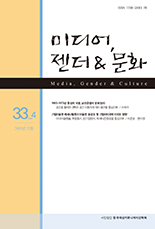 The purpose of this paper is to look into the cultural implication of male adult fandom by considering the conceptualization of male adult fandom which has newly appeared according to changes in the image of girl- idol groups. With this goal, the paper took discussions about becoming a fan of a girl idol group within an on-line male community as well as cultural criticisms and news since 2007 as the target of analysis. The image of a girl-idol group has been subject to feministic criticism at the level of making their body an object and at the level of their being girls. However, male adults who were made up of newly appeared fandom were formed into the image of an uncle who takes care of, sponsors, and worries about girls; thus, their fandom was considered to be different from an impure interest out of sexual love or taking girl groups as a sexual object. The voice of feministic criticism within discourses formed in this way failed to ensure its proper position, and ended up failing to propose an issue such as the taking of girls’ music groups as a sexual object.